Welcome to Beach House Retreat. If you love the beach and ocean then this is the place for you. Nestled under a big willow tree, this cozy cottage has a magnificent view of the Pacific Ocean and literally sits on a sandy beach with its own private deck and patio furniture. Put your feet up, take in the fresh salt air, enjoy a glass of wine and listen to the ebb and flow of the waves from your private sundeck overlooking the majestic San Juan Islands. Swim, suntan and walk the sandbars in the summer. Kitesurf and storm watch in the winter. If you are lucky, you will see one of the local sea otters pass by. From inside, this charming cottage has the look and feel of a Mediterranean villa. Its tasteful floor plan includes a bar-style table and chairs, a super-comfortable, Queen-sized bed, a bathroom with shower, cable TV, mini-refrigerator, wineglass set, microwave and coffee maker. Outside you’ll find an ocean-side sundeck and plenty of beach furniture to help maximize your outdoor comfort. WiFi is everywhere, so you can stream your favorite music on the beach or inside. This private seaside getaway is ideal for anyone needing a good dose of nature and tranquility. The spot is also great for honeymooners, beach hikers, kayakers, paddle boarders and Hobie Cat lovers – there is a place to launch many water toys right next door. Nearby services include four restaurants, a grocery store, a farmers market, the Cordova Bay Golf Course and the Trans-Canada bicycle trail. We are conveniently located within 20 minutes of downtown Victoria, Victoria International Airport, and Sidney by the Sea. The Swartz Bay Ferry Terminal (which provides transit to Vancouver and the Gulf Islands) is just 25 minutes away. Looking for more space? Ask for details on renting our 2-bedroom beach house suite (which has a kitchenette and sleeps an additional four people). We are a happily married couple, retired and enjoying our beautiful home on the beach in Cordova Bay. We fell in love with Cordova Bay and all that it had to offer. The Beach House Retreat sits on the beach is a free standing private cottage not connected to the house. 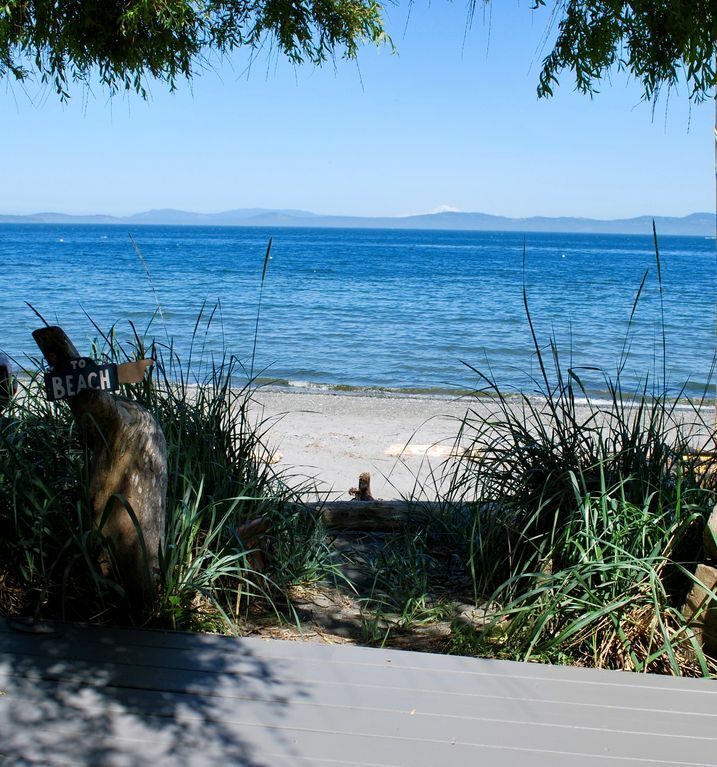 Once you step off of your deck you will be standing on the beautiful sandy beach. Limited cooking area, Hot plate, microwave, small fridge, coffee maker, toaster, kettle and BBQ available. Pools and Rec center close by. Nice little two night getaway. Thank you for a wonderful 2 night getaway for my wife and I. Michael thank you for your assistance over the phone and your easy to understand email and instructions. You helped make our travel to the cottage an easy one. I meet your Mom-Donna who helped to make sure we were set up perfectly and who later made sure we were doonf okay and had everything we needed and your Dadshowed us in when we arrived. We really the Sugar Shack cottage. Outside of a cloudy cool day on the day we arrived and a rainy day the morning we left, we had one very nice day (partly sunny) to totally relax and take in the beautiful sights. Also had some otters and seals to watch swim around and feed in the water. The cottage while small gave us everything we needed for a fun getaway for two. Loved the outside propane fire pit to keep us warm and deck chairs to sit in. Bathroom was small but it worked well. Love the place, hosts, views, and atmosphere. This property is a very nice get away for 2. The deck with beach view is just amazing. It is far enough away from the beach to be private feeling. The large window can be opened in the morning to lay in bed and just enjoy the sun. The beach is long enough for a nice walk but doesn’t make you feel obligated to go further. A very comfortable bed and responsive electric heat sized for the unit. Everything spotlessly clean. I just wanted to tell you how much dereck and I enjoyed our stay at your beautiful beach Sugar Shack . It was so breath taking just walking in . The Blue was warm and comforting .... I loved sitting on the deck in the Morning for the Amazing Sunrises and in the evening for the Moon .... Without a doubt, Dereck and I will be back again soon ...Thank you so much for your wonderful hospitality .. This mini cottage sits right on the beach! Not only is the view incredible but you can step out the door and go for a nice beach walk. The wide porch sits under a huge willow tree and is equipped with a table and two chairs, two lounge chairs, and a mini gas fire pit. The inside is charmingly decorated. Be prepared for tiny house living and lots of stairs (you have to get down to beach level from the house above). My daughter and I have spent the first week of September at the Beach House, and cannot thank enough Michael and Donna for the wonderful, relaxing, recharging experience. Clean, private, quiet and cozy place which we will definitely consider for our next year vacation. Perfect cottage for the rest needed! I couldn’t have asked for a better place to rest and relax for three days (while my hubby was up north sportfishing with colleagues). This is a perfect little studio cottage tucked away from the main house on property by a beautiful umbrella tree. Everything needed was included in the cottage (I rated it 4 stars, instead of 5 stars, as it would be nice to have had a small kitchen sink). I also enjoyed having the owners close by in the family house (they 100% respected my privacy but it gave me comfort knowing they were there). Not sure when I will return to Victoria but would certainly stay here again!! Thanks Michael & your family (hope you Dad is recovering from his surgery). The guest booking the reservation is requested to provide a copy of his or her passport or driver's licence at the time of check-in.